Inclusions: private roundtrip transportation and services of your tour guide, parking, tolls, and taxes. Departure points in Provence: The areas of Avignon, Arles; Aix-en-Provence and Marseille. Other departure points available. Inquire. This private Provence wine tour with wine tasting features the delectable wines and beautiful vineyards in Provence. The Provence region, home to over 1,000 kinds of wines, is primarily known for rosés and spicy, full-bodies red wines. The main grape variety throughout Provence is Mourvèdre, the primary component in many local rosés and reds. It is often blended with Grenache and Cinsault, with the latter being used as a significant component in most rosé. Your private wine tasting in Provence will take you to the vineyards and cellars of three or four (time permitting) leading wine producers located in Chateuneuf-du-Pape, Gigondas, Beaumes de Venise, Vacqueyras, Rasteau or Cairanne. As you visit the scenic vineyards in Provence, your private guide will explain the local appellation system and wine-growing culture, in particular the notion of “terroir”, the unique set of characteristics related to the geography, geology and climate of a particular place, which in turn give a wine its distinctive flavor. She will explain to you explain key elements of the winemaking process and the history of wine on your private guided visits to the exclusive cellars of Provence. You will sample three to four wines per estate, during which you will learn about the particular flavor characteristics of the Rhône grape varieties, the ageing potential of the wines and the varying influences of the terroir and cellar methods on the wines. Most of the wine tasting at the domains chosen include cheeses to go with the wines to further appreciate their fine wine. Restaurant recommendations will be provided from informal quick lunch to a more upscale lunch complete with wine pairing. You only need to advise us of your preference. 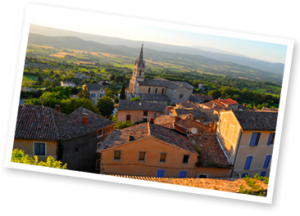 Like all of our private tours, this Provence wine tour can be customized to accommodate your special needs and interests.